Beautifully engraved certificate from the Confederate States of America authorized by an Act of Congress dated January 29, 1863. 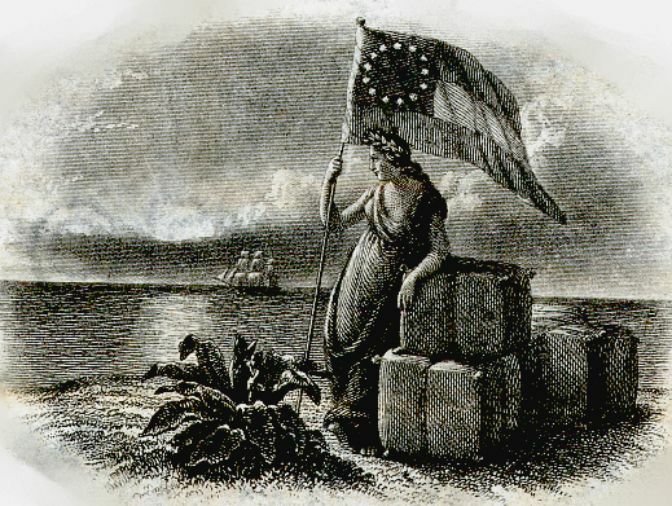 This historic document was printed by an unknown European printer and has an ornate border and a vignette of Liberty leaning on cotton bales and holding a CSA flag with a ship sailing off in the distance. The certificate has an orange brown tint on white watermarked paper with each coupon watermarked with its due date. This item is hand signed by Emil Erlanger, Loan Banker; J. Henry Schroeder (Schroeder, Wagg), London Bankers; Colin J. McRae, CSA European agent; and John Slidell, Confederate Commissioner to Paris. EF+ condition with 36 unused coupons not shown in scan attached to bond on right and left sides. The �0 bond is hard to find and is very desirable. One of the key events which made blockade running a viable business in the latter half of the war was the so-called Erlanger Loan (or "Cotton Loan"), an issue of bonds made by Emile Erlanger and Company of Paris. Because Confederate currency was worthless in Europe, Erlanger cotton bonds became the de facto currency used by the South when purchasing ships, supplies and other war materiel abroad. In a very real sense, the Erlanger Loan gave the Confederacy at least a modicum of financial solvency even as its generals suffered defeat after defeat. The Erlanger Loan was issued in five European cities -- London, Liverpool, Paris, Amsterdam and Frankfurt -- on March 19, 1863 and raised �759,894 ($8,535,486). These bonds were printed in four denominations : �0 (Fr2,500 or 4000 lb of cotton), �0 (Fr5,000 or 8,000 lb of cotton), �0 (Fr12,500 or 20,000 lb) and �000 (Fr25,000 or 40,000 lb). The bonds sold at 90% of face value, and were redeemable for Confederate government-owned cotton in the Confederacy itself. This last clause was a critical catalyst in stimulating blockade-running, because the holders of Erlanger bonds had to risk the Federal blockade to convert them into a tangible commodity. Since the face value of the Erlanger bonds was fixed, the actual cash value of the bonds varied with the fortunes of the Confederacy itself � usually downward. Within two weeks of the original issue, the cash value of the bonds had sagged to 87% of face value, and Erlanger and Co. began secretly buying up bonds to sustain the price. John Slidell (1793 - 1871) Born in New York City, N.Y., 1793, the Northern-born Slidell rose to prominence as a Louisiana politician in the decades before the Civil War. A lawyer who began his career as a businessman, he moved to New Orleans in 1819 after his mercantile interests failed during the War of 1812. Slidell lost a bid for Congress in 1828 and was frustrated in his political ambitions until 1843, when he was elected to the U.S. House of Representatives. As a states-rights Democrat he supported James K. Polk for the presidency in 1844 and used questionable legal means to assure him a Louisiana majority in the presidential election. Polk appointed Slidell commissioner to Mexico, with instructions to settle the Texas-Mexico boundary dispute and purchase New Mexico and California. The mission failed when the Mexican government refused to accept his credentials. Slidell was elected to the Senate in 1853 and cast his lot with other pro-Southern congressmen to repeal the Missouri Compromise, acquire Cuba, and admit Kansas under the Lecompton constitution. In the 1860 campaign Slidell supported Democratic presidential candidate John C. Breckinridge, but remained a pro-Union moderate until Abraham Lincoln's election pushed the Southern states into seceding. Siding with the South, Slidell accepted a diplomatic appointment to represent the Confederacy in France. His arrival in Europe was delayed by the TRENT AFFAIR, when he and fellow diplomat James M. Mason were removed from their British-registered ship by the commander of a Federal vessel. Once there, he found the French sympathetic to the Confederate cause, but met with little success in securing extensive military aid or the Franco-Confederate treaty of alliance he sought. Slidell remained in France lobbying throughout the war. Though he was never able to accomplish a Franco-Confederate liaison, and though many of his Confederate colleagues distrusted him, Slidell, through his political abilities and bolstered by his marriage to a Louisiana Creole woman, arranged some Confederate financing through private French interests. Uncertain of his safety at home after the war, Slidell and his family stayed in Paris. He never sought pardon from the Federal government for his Confederate service, dying in London, England, 29 July 1871. Frederick Erlanger, the son of Emile Erlanger (one of the most important bankers in Europe after the Rothschilds) had become infatuated with Mathilde Sliddell, with the result that the House of Erlanger agreed to take the entire bond issue at a price of 77. The bonds were then re-offered at 90. After an initial rise in price, the rumors of an imminent collapse of the CSA and the defeat of General Robert E Lee at Gettysburg caused a severe drop in the price. For a time, the market was supported by the use of the bonds抯ale proceeds to repurchase such bonds on the open market. Indeed, it was felt at the time that the Erlangers took advantage of such support to sell their remaining holdings, though the banking firm did hold a large position in these bonds well after the war.